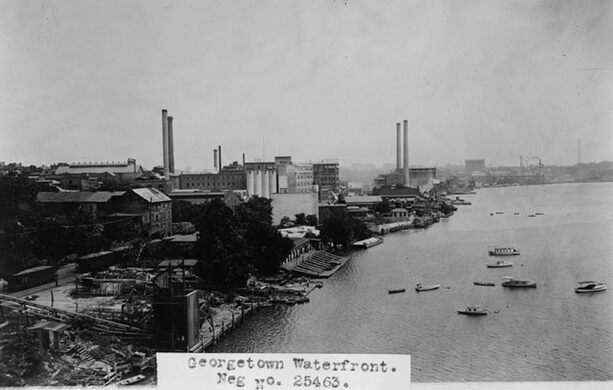 The Georgetown waterfront is one of the oldest areas in the Washington, D.C. region. Today it is a park, but over the years it has experienced evolving periods of commercial prosperity and urban blight. 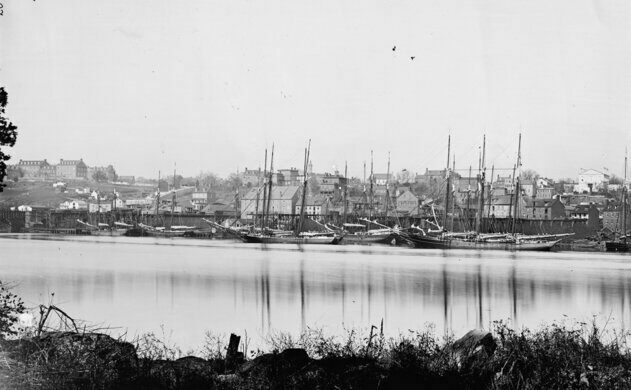 After the Civil War the port entered into a long period of decline, as numerous factors contributed to make Georgetown a less than attractive navigational destination. Construction of the Long Bridge at 14th Street prevented sailing ships with large masts from traveling up the river. Worse still, the piers that supported the bridge span were magnets for sediment, and the Potomac soon began to silt up. The port began to hemorrhage traffic as steam power replaced sails and the size of oceangoing ships increased. The draft on these new larger ships required depths greater than the 20-foot waters at Georgetown. The waterfront was revived in the beginning of the 20th century as new factories sprouted up. The American Ice Company produced and stored its frozen products in large ice houses opposite the present day movie theater. The Brennan Construction Co. facility churned out the building materials for bridges and road paving projects across the city. B&O railroad tracks were built along Water Street to deliver Ohio coal to a large Pepco power plant. Construction began on Key Bridge in 1918, and the art deco landmark opened six years later in 1923. Key Bridge’s aging neighbor, the old Aqueduct Bridge, was torn down in 1933 and most of the waterfront factories relocated or went out of business over the next decade. In 1949 the Whitehurst Freeway—Washington’s first elevated “sky road”—was built over Water Street. Construction of the steel viaduct had been delayed by World War II; metal was needed in the arsenals, and gasoline rationing meant there was less traffic anyhow. Urban redevelopment on Water Street kicked into high gear in the 1980s. The City Council’s prediction proved accurate, and the buildings that sprouted up opposite the waterfront were by and large a tasteful mix of brick and stone modernist structures. Some of the names of these buildings allude to their industrial history. The Papermill condos are located next to the former premises of the District of Columbia Paper Manufacturing Company factory. And the Power House office building used to be a part of the Capitol Traction Company’s trolley facilities. In 1985 the city government transferred ownership of the parking lots south of Water Street to the National Parks Service. NPS landscape architects put together a design for the project, but they lacked funds to begin construction and the neglected area sat vacant for three decades. 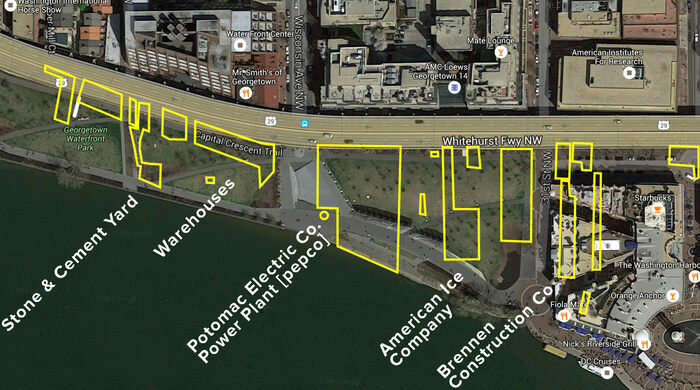 Finally, in the mid 2000s a nonprofit group Friends of the Georgetown Waterfront Park succeeded in raising the $23 million necessary to fund the project. 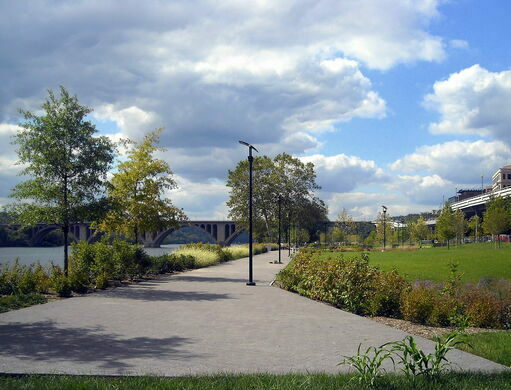 The initial section opened in 2008 and by 2011 the Georgetown Waterfront Park was complete. This stately mansion, built in 1787 by America's first Secretary of the Navy, is rumored to be one of the most haunted buildings in Washington, DC. A small token of gratitude from freezing cold journalists who were given a warm haven while covering JFK's inauguration. This lovely pocket park is one of the most under appreciated in D.C.
An abandoned gun-funded 19th century utopia.